Many tall fescue pastures in Alabama, Tennessee and most of the United States are infected with a systemic fungus, Acremonium coenophialum. This fungus is harmless to the host plant, but it is responsible for a variety of symptoms known as fescue toxicosis, summer syndrome, and summer slump when infected plants are consumed by cattle. The fungus is endophytic, meaning it grows within the tillers, culms, and inflorescence of the grass without invading the host, as do most of the other saprophytic or pathogenic fungi producing mycotoxins. In fact, there is evidence that the endophyte has evolved a mutualistic relationship with the grass, conferring a survival advantage in some situations. 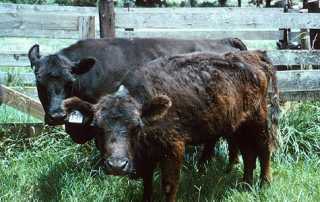 In cattle, symptoms of fescue toxicosis include reduced average daily gains, lower milk production, reduced reproductive potential, elevated body temperature, rough hair coat, and reduced prolactin levels. “Fescue foot” is like ergotism in that feet or other extremities may become gangrenous and drop off. Horses typically show only reproductive disorders when eating infected fescue. Agalactia, abortions, thickened placenta, prolonged gestation, and large foals resulting in dystocia are typical. The ergopeptine alkaloids similar to those produced by ergot (Claviceps) have been identified in endophyte-infected fescue, but other alkaloids may be involved as well.